To those of you, like myself, who have experienced the 80’s skateboarding boom, the name Christian Hosoi will ring a bell and bring back a lot of memories. He was the skater with the most natural talent, pushing the limits with his powerful style & flow. He was the outspoken rebel, the styler, the womanizer. He was simply the man. To most he was just a rock star, to a selected few he was a fierce competitor. 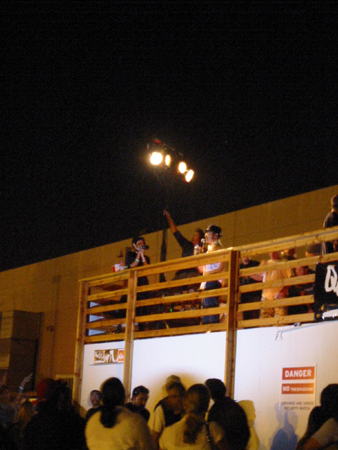 Tony Hawk and Christian Hosoi dominated the 80’s vert competitions, delivering a thrilling heads-on battle between Christian’s powerful & extravagant style and Tony’s technical mastery. On this night, I was one of the lucky ones to see the world premiere of “Rising Son” at the Quiksilver headquarters down in Huntington Beach. 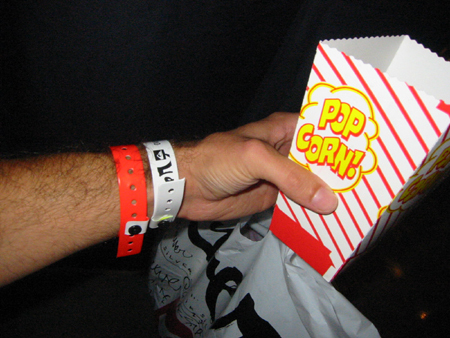 After equipping myself with the necessary wrist bands for access all areas, I grabbed a bag of pop corn and a beer and was ready for the night. 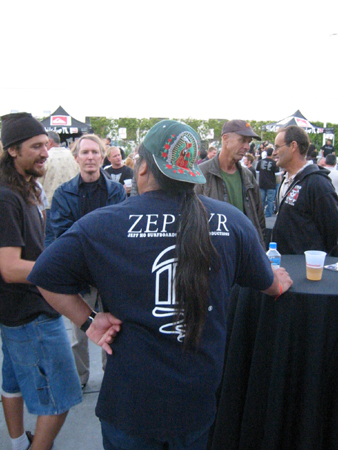 After just a few minutes I already bumped into Tony Hawk and also Jeff Ho who designed the boards for the legendary Zephyr Surf Team (Z-Boys). 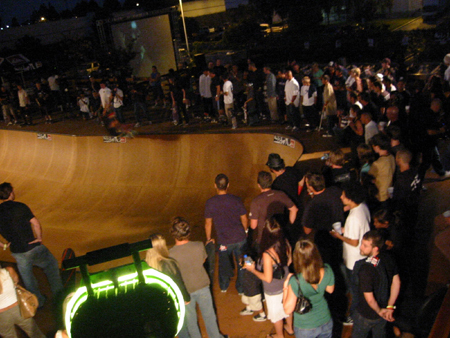 But apart from schmoozing with celebrities, there was also a lot of young talent to watch in the skate bowl before the screening of the movie. 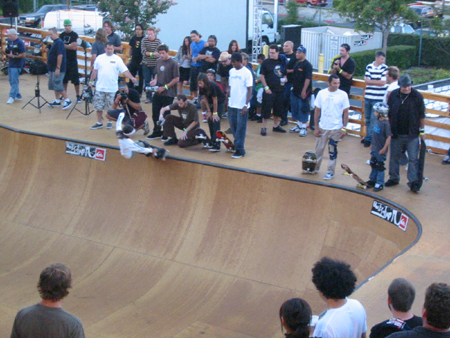 The skate bowl united skaters of all ages, like this Hosoi-anesque young kid, shredding the coping like there’s no tomorrow. 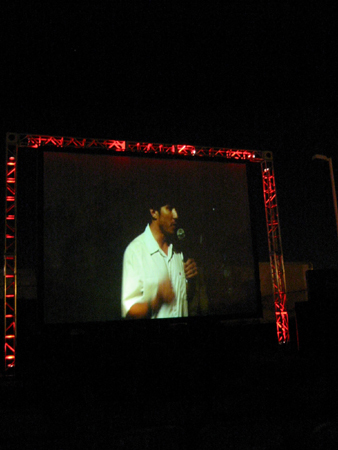 After an extended skate session at sun down the crowd moved on to the screening of the movie. 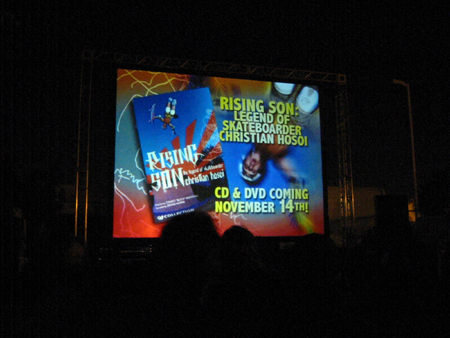 “Rising Son”, which is narrated by Dennis Hopper and directed by Cesario “Block” Montano, follows Christian Hosoi’s life from his rise to the first true skateboard superstar, to his fall and imprisonment, ending with his miraculous recovery. Never-before-seen home movies and footage of the early years illustrate the richness of the 80’s skateboard culture and let the viewer immerse completely into the skate scene of the time. Interviews of his family and friends, including such skate legends as Tony Hawk, Tony Alva and Jay Adams enhance the feeling of authenticity. After depicting the enthused and unparalleled rise to skateboard stardom, “Rising Son” does not compromise to show the harshness of his tragic fall and dark years of drug addiction with the climax of his arrest at Honolulu airport for drug trafficking. During his imprisonment Christian, who invented the specatular “Christ Air” forming the shape of a cross with his body in mid air (shown on the DVD cover), found the religion of Christ which gave him the inner strength for his recovery and way back into his new life. He resumed his skateboarding career and is on the Quiksilver team. From the “Christ Air” to now being an associate pastor at a church of Christ in Huntington Beach – Was it his destiny all along? He found his way and many will be inspired to find theirs through him ! A different kind of stardom.